The seed ball is a little garden all its own with the seed, the compost to nurture the seed, a little chili powder to deter pests, and the clay as its soil all mixed together. 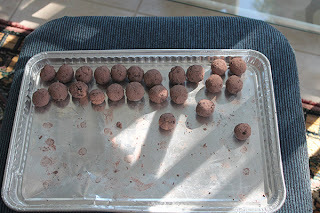 A post in the blog, Heavy Petal, was the inspiration for my seed-ball-making interest. 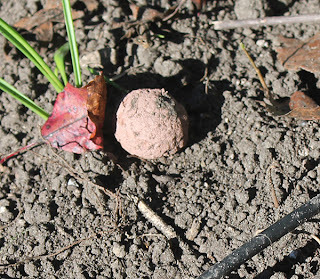 http://heavypetal.ca/archives/2011/01/step-by-step-how-to-make-seed-balls/ Surely this was a super way of putting native seeds into unused spaces. 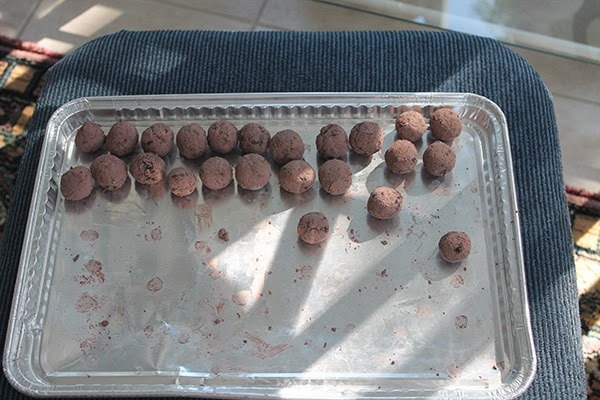 I made my seed balls using seeds of native plants harvested here in Ontario and purchased from Tallgrass Ontario: blue vervain, tall coreopsis, culver's root, grey-headed coneflower and showy tick trefoil. All these seeds need some stratification so fall is the best time to "toss" them. When the seed balls were dry, I packaged them in little boxes and give them away as gifts to native plant buffs. 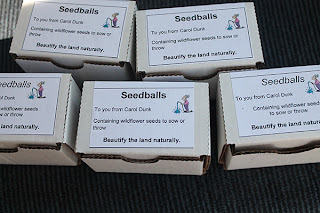 I've also placed some seed balls in my own garden and will watch for their development in the spring. The squirrels move them around a bit but, perhaps because of the chili, don't damage them.